The City of Woburn’s 375th Anniversary Committee has a great day of summertime baseball family fun and a vintage baseball tournament planned for Saturday, July 22, from 10 a.m. to 4 p.m., at Library Field. Admission is free of charge. The day kicks off at 10 a.m. with Red Sox baseball and Fenway Park right here in Woburn, courtesy of the traveling Red Sox Showcase. The traveling showcase truck is making a stop here in Woburn, complete with batting cages, pitching stations, a Steal 2nd Challenge, and virtual reality experience. 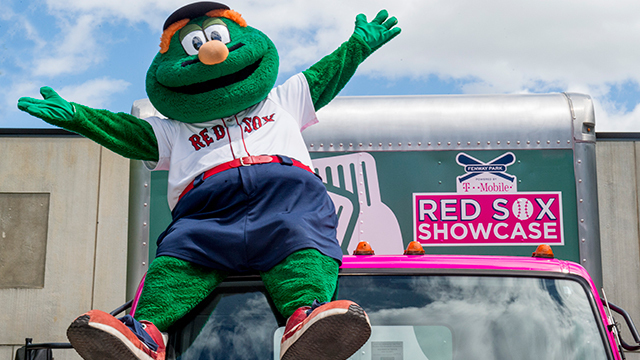 In addition, the Red Sox are also bringing the World Series Trophy (10:30 a.m. to 11:30 a.m.) and Wally the Green Monster (11 a.m. to 12 p.m.). Stop by and catch some Red Sox fever! All children must be accompanied by an adult. Save time by going online to complete release forms before you arrive at http://boston.redsox.mlb.com/bos/fan_forum/mobile-showcase/. Woburn’s summer baseball fever continues at noon with an “1867 rematch” of two top-notch area semi-professional vintage league baseball teams. The winner of the vintage rematch will face a team of local celebrities including Former New England Patriot Garin Veris (now athletic director at Mass Maritime Academy), Mayor Scott Galvin, Woburn High School Varsity Softball Coach Courtney (Nelson) Sigsbury and players, Woburn High School Varsity Baseball Coach Joe Wells and players, Woburn Little League Directors Mark Cavicchi and Tom Skeffington, Woburn Recreation Director Rory Lindstrom, City Council President Rich Haggerty, and State Rep James Dwyer. The games will feature fun play-by-play coverage by local sports announcer Nick Perenick. Lord Hobo will be on hand for the vintage games with a selection of its cold fresh brews for the adults in the crowd. Proper ID required. The 19th century-styled games will feature top-notch area vintage league players and 1864 rules that include pitching the ball underhand from 45 feet away (not the 60 feet of today) and no fielding gloves (just bare hands). Add to that some rules such as the allowance of leading and stealing, and you’ve got a great, fast-paced game—just as it was played in the 1800s. The day will also feature plenty of hamburgers and hot dogs and soft refreshments, as well as a visitor photo booth. The City is grateful to all of our 375th Anniversary sponsors and volunteers for their support in bringing this event to the Community free of charge. For more information about our sponsors and the yearlong 375th Anniversary Celebration go to www.woburn375.com.